The annual Road Safety Course organised by DRSC, a cooperation of Delft University of Technology, SWOV Institute for Road Safety Research, Delft Post Graduate Education and Road Safety for All, has kicked off! Over 20 road safety professionals from 18 low and middle income countries are being trained from September 11 to 22. Participants in this 2017 course will follow lectures given by world renowned experts on a wide range of road safety topics. Among these experts are several SWOV researchers: SWOV's director Peter van der Knaap, Henk Stipdonk, and Govert Schermers. 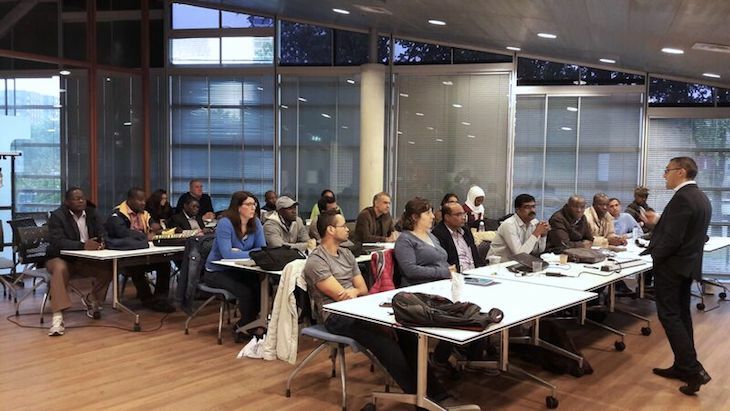 Besides the lectures given in Delft, participants are offered excursions to SWOV, infrastructural projects in the province of South Holland and Amsterdam. The final assignment is to apply the acquired knowledge to a case from their own country, this year ranging from Uruguay to Nigeria and from Vietnam to Bahrain. DRSC courses are ‘evidence based and data driven’ and take their conceptual framework from the Safe System Approach. Participants are trained to analyse road safety problems and learn how to come to effective and efficient solutions, making use of the growing stock of data and knowledge. This includes the development and implementation of road safety strategies adapted to local conditions. Interested in attending the next DRSC in 2018? Register in January 2018 at delftroadsafetycourses.org. DRSC course members, September 15.